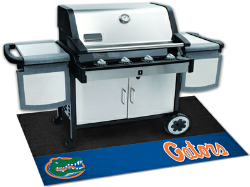 Show your school spirit with an NCAA® Officially Licensed Grill Mat! These 100% vinyl grill mats are a universal fit to most grills, prevent spills from soaking in and staining, and clean up easily with a garden hose. 34 schools available. Bring the NFL® to your deck or patio with an officially licensed Team Grill Mat. These 100% vinyl grill mats are a universal fit to most grills, prevent spills from soaking in and staining, and clean up easily with a garden hose. All 32 teams available. Show off your favorite NHL team and protect your deck with an Officially Licensed Grill Mat! These 100% vinyl grill mats are a universal fit to most grills, prevent spills from soaking in and staining, and clean up easily. All 30 teams available.